Depending on your politics the election will have left you feeling cast down or jubilant. Personally, I’m stunned. But cheered that here in multi-cultural Peckham/Nunhead we have voted a fetching shade of Red – Harriet Harman was returned with an increased majority – eschewed the Blues, the Yellows and the smelly Kippers. Hurrah. Now what? A revolution, please. 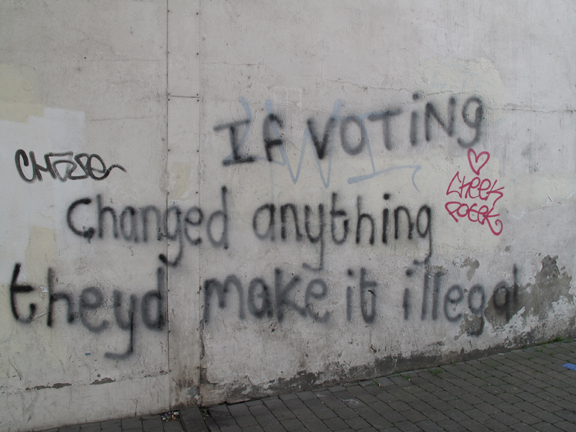 Here’s a message from a wall in Peckham. Great – let’s all give voice and paint to our opinions. This entry was posted in Nunhead, Peckham, Photography, Rye Lane, street photo, Writing and tagged awful, dismal, five more years, graffiti, Harriet Harman, terrible, the election, voting. Bookmark the permalink.